After an audience with the Crusader Queen, the heroes journey to a fortress that straddles the boundary between this world and the demon-haunted realm of the Abyss. There, they must face powerful agents of the architects of the Worldwound and put a stop to the production of the powerful elixirs being used to grant demons mythic power. Beyond the fortress lies the Abyssal realm of the Midnight Isles, lair of the succubus queen Norticula - and the source of the crystals used to create the mystical elixirs. Can the heroes navigate the intrigues of the Midnight Isles to strike a critical blow for the forces of good? And can they avoid losing their souls to darkness in the process? 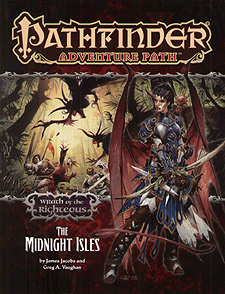 "The Midnight Isles," a Pathfinder RPG adventure for 12th-level characters with 5 mythic tiers, by James Jacobs and Greg A Vaughan. A demonic siege in the Pathfinder's Journal, by Robin D Laws. Four new monsters, by Amanda Hamon and James Jacobs.